Mar Jose Chittooparambil CMI was born on 10th December 1954 at Neeleeswaram, Ernakulam (Dist. ), Kerala. He is the 3rd among the 9 children of his beloved parents - Late Mr. C. V. Cherian and Mrs. Mariam Cherian. 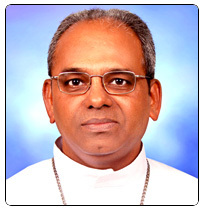 He hails from the Assumption Monastery Parish, Neeleeswaram of the Archdiocese of Ernakulam- Angamaly. After passing the 9th std., he joined the Sacred Heart Province, Kalamassery of CMI Congregation in 1971 and passed SSLC from Infant Jesus High School, Vazhakulam in 1972. He completed Pre-degree from St. Paul's College, Kalamassery. He did his Graduation in Philosophy (B. Ph.) and Theology (B.Th.) from Dharmaram College, Bangalore, and Bachelor of Arts (B.A.) and Master of Social Work (MSW) from Rajagiri College of Social Science, Kalamassery. Bishop Jose did his Novitiate at Karukutty and made his First Religious Profession on 5th June 1977. During the time of Late Bishop Jonas Thaliath CMI, Bishop Jose opted for working in Gujarat Mission just after his Philosophical studies and became the member of St. Xavier's Region, Rajkot. He was ordained a priest on May 8, 1985 by Rt. Rev. Dr. Gregory Karotemprel CMI, Bishop of Rajkot, and started his priestly ministry as Asst. Parish Priest at Immaculate Conception Parish at Rajkot. His first appointment was to start a new Mission Station at a very remote village called Nanikatechi in Surendranagar Dist., Gujarat. Staying in a mud house without even the basic facilities of a toilet or a bath room he worked hard for the development of the poor and marginalized people of that area and developed the Social Work Centre within his four years of service there. Then, he worked for three years in Poornodaya Training Centre, Bhopal as its Administrator. When St. Xavier's Province, Rajkot was erected in 1994, Bishop Jose was elected the Provincial Councilor of Social Work. He was also appointed the Superior of the Provincial House at Rajkot. He was appointed the Diocesan Director of Social Work in the year 1994 and served the Diocese being in the post for long 14 years. During this time with the guidance and support of Bishop. Gregory, he initiated many projects and developed the Diocesan Department of Social Work (Navjeevan Trust) making it a very popular NGO in the State of Gujarat. He was instrumental in starting many Mission Centers of the Diocese of Rajkot. As the Diocesan Director of Social Work he successfully coordinated the Relief and Rehabilitation Program for the Victims of the devastating Gujarat Earthquake of 2001. He took the initiative for the purchase of a land for Christ Hospital at Rajkot and started the construction work. He was a Member of the Project Selection Committee of Caritas India, New Delhi for three years and the Western Regional Bishop's Council appointed him the Treasurer of Western Region Social Service Forum, Mumbai. He is the Managing Editor of Third Millennium from the year it started in 1988. He was also the Eparchial (Diocesan) Consulter for several years. In 2008 he was elected the Provincial Superior of CMI St, Xavier's Province, Rajkot. During the time of his administration, the Province made tremendous growth. While being the Provincial he was appointed the Bishop of Rajkot to succeed Bishop Gregory Karotemprel CMI who is retiring after 27 years as the Bishop of the Diocese of Rajkot. His episcopal ordination was on 11 September 2010.